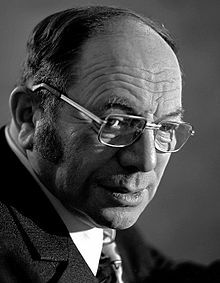 Leonid Vitalyevich Kantorovich (19 January 1912 – 7 April 1986) was a Soviet mathematician and economist, known for his theory and development of techniques for the optimal allocation of resources. He is regarded as the founder of linear programming. He was the winner of the Stalin Prize in 1949 and the Nobel Prize in Economics in 1975. The method of successive approximations is often applied to proving existence of solutions to various classes of functional equations; moreover, the proof of convergence of these approximations leans on the fact that the equation under study may be majorised by another equation of a simple kind. Similar proofs may be encountered in the theory of infinitely many simultaneous linear equations and in the theory of integral and differential equations. Consideration ofjkbni semiordered spaces and operations between them enables us to easily develop a complete theory of such functional equations in abstract form. I discovered that a whole range of problems of the most diverse character relating to the scientiﬁc organization of production (questions of the optimum distribution of the work of machines and mechanisms, the minimization of scrap, the best utilization of raw materials and local materials, fuel, transportation, and so on) lead to the formulation of a single group of mathematical problems (extremal problems). These problems are not directly comparable to problems considered in mathematical analysis. It is more correct to say that they are formally similar, and even turn out to be formally very simple, but the process of solving them with which one is faced [i.e., by mathematical analysis] is practically completely unusable, since it requires the solution of tens of thousands or even millions of systems of equations for completion. I have succeeded in ﬁnding a comparatively simple general method of solving this group of problems which is applicable to all the problems I have mentioned, and is sufﬁciently simple and effective for their solution to be made completely achievable under practical conditions. Kantorovich (1960) "Mathematical Methods of Organizing and Planning Production." Management Science, 6(4):366–422, 1960, p. 368); As cited in: Cockshott, W. Paul. "Mises, Kantorovich and economic computation." (2007). Once some engineers from the veneer trust laboratory came to me for consultation with a quite skilful presentation of their problems. Diﬀerent productivity is obtained for veneer-cutting machines for diﬀerent types of materials; linked to this the output of production of this group of machines depended, it would seem, on the chance factor of which group of raw materials to which machine was assigned. How could this fact be used rationally? This question interested me, but nevertheless appeared to be quite particular and elementary, so I did not begin to study it by giving up everything else. I put this question for discussion at a meeting of the mathematics department, where there were such great specialists as Gyunter, Smirnov himself, Kuz’min, and Tartakovskii. Everyone listened but no one proposed a solution; they had already turned to someone earlier in individual order, apparently to Kuz’min. However, this question nevertheless kept me in suspense. This was the year of my marriage, so I was also distracted by this. In the summer or after the vacation concrete, to some extent similar, economic, engineering, and managerial situations started to come into my head, that also required the solving of a maximization problem in the presence of a series of linear constraints. In the simplest case of one or two variables such problems are easily solved—by going through all the possible extreme points and choosing the best. But, let us say in the veneer trust problem for ﬁve machines and eight types of materials such a search would already have required solving about a billion systems of linear equations and it was evident that this was not a realistic method. I constructed particular devices and was probably the ﬁrst to report on this problem in 1938 at the October scientiﬁc session of the Herzen Institute, where in the main a number of problems were posed with some ideas for their solution. The universality of this class of problems, in conjunction with their difficulty, made me study them seriously and bring in my mathematical knowledge, in particular, some ideas from functional analysis. What became clear was both the solubility of these problems and the fact that they were widespread, so representatives of industry were invited to a discussion of my report at the university. The university immediately published my pamphlet, and it was sent to ﬁfty People’s Commissariats. It was distributed only in the Soviet Union, since in the days just before the start of the World War it came out in an edition of one thousand copies in all. Soviet Union, since in the days just before the start of the World War it came out in an edition of one thousand copies in all. The number of responses was not very large. There was quite an interesting reference from the People’s Commissariat of Transportation in which some optimization problems directed at decreasing the mileage of wagons was considered, and a good review of the pamphlet appeared in the journal "The Timber Industry." In the spring of 1939 I gave some more reports—at the Polytechnic Institute and the House of Scientists, but several times met with the objection that the work used mathematical methods, and in the West the mathematical school in economics was an anti-Marxist school and mathematics in economics was a means for apologists of capitalism. This forced me when writing a pamphlet to avoid the term "economic" as much as possible and talk about the organization and planning of production; the role and meaning of the Lagrange multipliers had to be given somewhere in the outskirts of the second appendix and in the semi Aesopian language. In our time mathematics has penetrated into economics so solidly, widely and variously, and the chosen theme is connected with such a variety of facts and problems that it brings us to cite the words of Kozma Prutkov which are very popular in our country: "One can not embrace the unembraceable". The appropriateness of this wise sentence is not diminished by the fact that the great thinker is only a pen-name. In planning the idea of decentralization must be connected with routines of linking plans of rather autonomous parts of the whole system. Here one can use a conditional separation of the system by means of fixing values of flows and parameters transmitted from one part to another. One can use an idea of sequential recomputation of the parameters, which was successfully developed by many authors for the scheme of Dantzig-Wolfe and for aggregative linear models. A solution of newly appearing economic problems, and in particular those connected with the scientific-technical revolution often cannot be based on existing methods but needs new ideas and approaches. Such one is the problem of the protection of nature. The problem of economic valuation of technical innovations efficiency and rates of their spreading cannot be solved only by the long-term estimation of direct outcomes and results without accounting peculiarities of new industrial technology, its total contribution to technical progress. The accounting methods based on mathematical models, the use of computers for computations and information data processing make up only one part of the control mechanism, another part is the control structure. Linear programming was developed as a discipline in the 1940's, motivated initially by the need to solve complex planning problems in wartime operations. Its development accelerated rapidly in the postwar period as many industries found valuable uses for linear programming. The founders of the subject are generally regarded as George B. Dantzig, who devised the simplex method in 1947, and John von Neumann, who established the theory of duality that same year. The Nobel prize in economics was awarded in 1975 to the mathematician Leonid Kantorovich (USSR) and the economist Tjalling Koopmans (USA) for their contributions to the theory of optimal allocation of resources, in which linear programming played a key role. Many industries use linear programming as a standard tool, e.g. to allocate a finite set of resources in an optimal way. It is difficult to distinguish another scholar in the history of the twentieth century who contributed as much as him to the fusion of mathematics and economics, the sciences with the antipodal standards of scientiﬁc thought. Israel Gelfand pointed out that he can list only John von Neumann and Andrei Kolmogorov alongside Leonid Kantorovich among those few of his contemporaries who synthesized the mathematical and humanitarian cultures. Semën Samsonovich Kutateladze, "Kantorovich's phenomenon," Siberian Mathematical Journal, 48 (1) (2007), 1-2. This page was last edited on 5 June 2018, at 23:47.